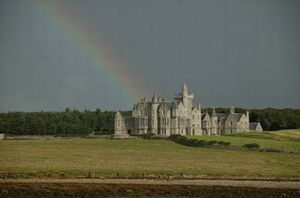 Balfour Castle was completed in 1848 to the order of the then owner, David Balfour, 4th Laird of Balfour and Trenabie. The Edinburgh based architect, David Bryce, was commissioned to extend the south of the building already on site. The Castle is said to incorporate 7 turrets, 12 exterior doors, 52 rooms and 365 panes of glass. The current owners of the Castle have lived there for over 40 years and have run it as a hotel for over 18 years. During May to September the Castle and Gardens are open on Sunday afternoons for personally guided tours. The tour includes a home-baked tea with scones, shortbread, locally made cheese and home made jams served in the Castle's Dining Room. Booking is necessary. The ferry to the island takes you close to the island of Helliar Holm, allowing you to see the seal colony - seals and weather permitting. Schools and special interest groups can organise their own tour by arrangement, please telephone. By air: Fly to Kirkwall and then by Shapinsey ferry. By sea: Ferries from various points, please telephone.